Sophomores Hunter Dickinson and Earl Timberlake have paired with junior Justin Moore to provide a depth of talent for No. 15 DeMatha (MD) this season. Why is this important heading into the 2018 Washington Catholic Athletic Conference playoffs? While other WCAC powerhouses such as Paul VI (VA) and Gonzaga (DC) have taken major blows to their rosters due to injury, the second-seeded Stags have stayed strong as they prepare to host No. 7 seed Ireton in the WCAC quarterfinals on Saturday. 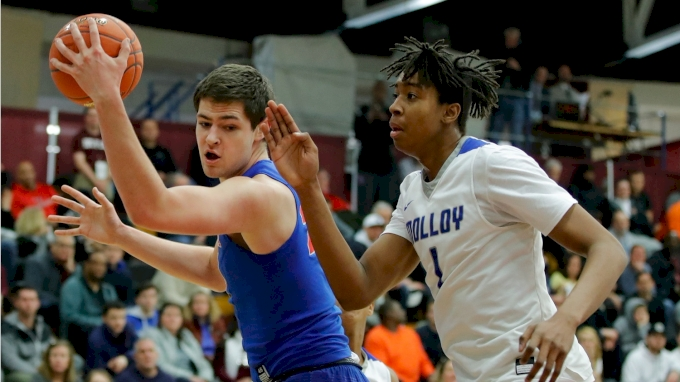 Among DeMatha's trio of standouts, Dickinson has shown skill beyond his years in the post, flashing great footwork and touch around the rim. His classmate, Timberlake, is an explosive guard who has showed no signs of slowing down this season. Meanwhile, Moore is a combo-guard who can knock it down from long range off the dribble and find his way to the rack. Behind this solid core, the Stags might just be the team that catches the WCAC sleeping. The WCAC will crown another champion this Monday at American University. Be sure to watch the semifinals (Feb. 25) and finals (Feb. 26) live on FloHoops.